Introduction: Gena Philibert-Ortega is a genealogist and author of the book “From the Family Kitchen.” In this guest blog post, Gena writes about the knitting, sewing and quilting efforts of women on the home front during World War II to support the Red Cross and the war effort—and how local newspaper articles about these women provide good information for your family history searches. Have you documented your family’s lives during World War II? With the upcoming 71st anniversary of Pearl Harbor Day this Friday, it’s an important reminder to document those stories now before it’s too late. The Greatest Generation’s numbers are decreasing daily, memories are fading and family stories will soon be lost. No doubt it’s important to research your military ancestors and what they were doing in the war to record your family history. Equally important is finding out about those that were left behind on the home front during wartime. Women, children and non-military men played important roles in the war by sacrificing through rationing of food and other material goods, working in industries that supported the war effort, taking over jobs for those who were fighting, and lending their time and talent to help those in need here and abroad. Women filled many roles during World War II: they served in the military, they worked in industries like aircraft manufacturing and farming, and they also lent their skills to volunteer efforts. One such example is the sewing that was done for the Red Cross. The American Red Cross, founded in 1881 by Clara Barton, coordinated various efforts during the World War II years that assisted service men and women, civilians, and war victims. They shipped supply packages and helped to ensure a blood supply for soldiers. (You can read more about the history of the American Red Cross on their website.) 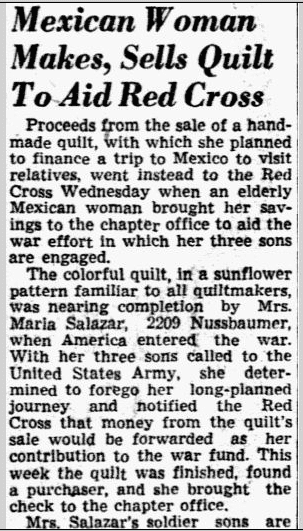 One way American women helped Red Cross efforts was through sewing and the raffling of finished projects to raise much-needed funds. This knitting and sewing effort during World War II wasn’t a new idea. World War I saw women sewing and organizing groups that crafted materials to benefit soldiers and those who were victims of the war. Socks were knitted; pajamas, sheets and shirts were sewn; and quilts were pieced and quilted. Women’s benevolent sewing, knitting and quilting work was featured in their local newspapers. Meeting notices, project photos, and participants’ names were all documented for the community. 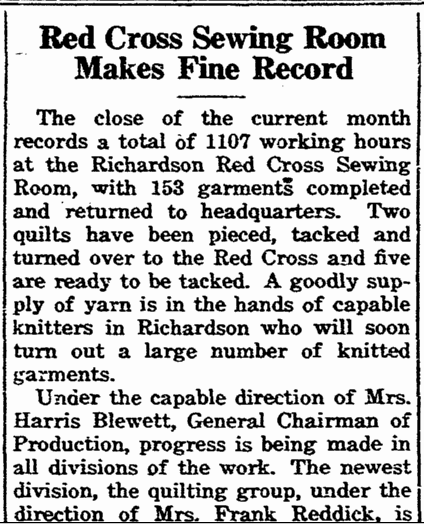 This historical newspaper article, also from Texas, details the amount of volunteer hours spent in the Red Cross Sewing Room. Products created included 446 woolen garments, 28 knitted garments and 2 quilts made by 616 women. 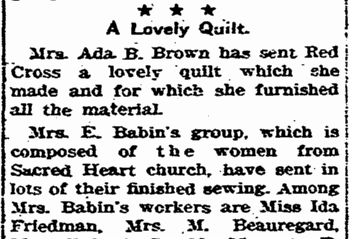 This Louisiana article makes note that a quilt was sent to the Red Cross by Mrs. Ada B. Brown and also lists the names of every woman in her sewing group. Military records are an important resource in researching your World War II military ancestors. To get a fuller picture of everyone’s involvement in the war effort, however, turn to newspapers—they are important in learning more about the local history of an area including the activities on the home front. * Reich, Sue. World War II Quilts. Atglen, PA: Schiffer Pub, 2010. Page 138. Thanks for reminding us of some of our old family stories. My Mom used to tell us of when she was in Catholic elementary school in Jersey City during WW2. She was required to knit a 4 inch square every night. They were later assembled into quilts. It was called Knittin’ for Brittain. Her mother, my grandmother, worked as a brakeman on the railroad during that time. Remarkable women.